Dr. Szabolcs Nagy has experience in ornithology, particularly in flyways and farmland bird conservation, species and site management planning, agri-environmental measures, Environmental Impact Assessment, project and programme development, organisational management, capacity building, network development, monitoring and information management, policy analyses and advocacy both at national and international level particularly at the European Union, the African-Eurasian Waterbird Agreement and the Ramsar Convention on Wetlands. His main interest is the sustainable management of biodiversity and their key sites using the best available knowledge for systematic conservation planning and feeding that into relevant practical and policy actions at national and international level and developing innovative solutions to reduce the biodiversity loss at key sites. He had missions to over 50 countries and has a wide network of contacts particularly in Europe, Central Asia, the Middle East and Africa, but also in the Americas and Australasia. At Wetlands International, he led the development of novel approaches to information management such as the award winning Critical Site Network Tool and the Waterbird Population Estimates Portal. He has successfully reorganised and developed the waterbird monitoring work in the Africa-Eurasia region. He has also played a pioneering role in the development of the Global Wetlands Observation System and built up a new information management unit. Szabolcs graduated as an agronomist with an Honours Degree in 1989 from the University of Gödöllő, Hungary. In 1994, he completed an MSc on nature conservation and, in 2008, his Ph.D. on the ecological impacts of the Common Agricultural Policy both at the University of West Hungary. He started working as a warden at the Middle Tisza Landscape Protection Area in Hungary. He worked as project manager and then Conservation Director for the Hungarian Ornithological and Nature Conservation Society (MME/BirdLife Hungary) between 1991 and 1999. 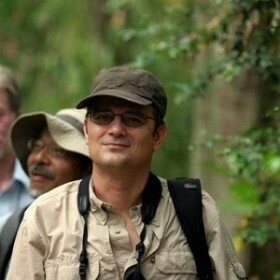 He was the European Conservation Manager of BirdLife International between 1999 and 2006. He worked for Wetlands International as project manager and as Head of the Biodiversity and Ecological Network Programme between 2006 and the end of 2013. Along with his job at the Rubicon Foundation, Szabolcs continues to coordinate the African-Eurasian Waterbird Monitoring Partnership, supports and represents Wetlands International on waterbird monitoring and flyway conservation issues as a Senior Advisor. Szabolcs lives in the Netherlands with his family and he is a keen birdwatcher and photographer.